It’s been two years since Coyotes Ice, LLC, owners of North Scottsdale’s Ice Den, doubled down on its bet on hockey in the desert. That bet is clearly paying off. After taking over a sprawling, yet somewhat faltering, multi-sheet ice facility in West Chandler, some 34 miles south of the organization’s original home at Bell Road and Loop 101, after pumping a large financial investment into the ice plant and visitor experience and after introducing a USA Hockey-guided development program and doubling its output of travel teams from Year 1 to Year 2, it’s easy to see why Ice Den leadership sees itself these days not as two different facilities, but instead as one cohesive organization that just so happens to have a pair of buildings serving the greater Phoenix region. As president of Coyotes Ice, it doesn’t surprise Mike O’Hearn that the “new” Ice Den Chandler, located near Interstate 10 and Ray Road, has managed to put itself on par with the Scottsdale site – the latter long considered one of the nation’s top hockey and skating facilities. What was surprising, he admitted, was how fast it happened. “You can see how quickly we’ve come along in what is really a very short period of time,” O’Hearn said. Kristy Aguirre, recently named executive director of the Coyotes Amateur Hockey Association (CAHA), cites CAHA’s long-running “pyramid” model as a major part of why that cohesion, at least on the hockey front, happened so quickly. As the Jr. Coyotes AA development hockey director (with teams housed out of both facilities), Kenny Corupe – a former pro player himself, not unlike Mike DeAngelis, CAHA’s AAA elite hockey director – likened the off-ice success of the Chandler addition to how any good team finds its own on-ice success. And it’s a battle they’re winning, Aguirre added. Combined, CAHA now houses 26 travel teams between the two rinks. That includes 11 AAA and seven AA squads out of Scottsdale and eight AA rosters from Chandler. The latter is already double what it was a year ago, and with the number of house and development players in Chandler into the 200s, travel hockey in Chandler is poised to growing further, while Scottsdale maintains its own prominence on the Valley’s northeast end. Cohesion doesn’t just happen because someone wants it to. It takes a whole lot of work, a boatload of trust, and putting the right people in place to make it happen. That’s what O’Hearn is certain CAHA has done. DeAngelis and Gruber have been around for years, while Corupe took on his role overseeing the AA program in Chandler and Scottsdale a little over a year ago. Then there’s Gary Ihling, recently instituted as CDP development hockey manager in Chandler – overseeing learn-to-skate, development and house programs. Ihling noted that working with Corupe, in particular – giving kids a path to opportunities in travel hockey – was much-needed in Chandler. Corupe said that sort of thinking is exactly what has to happen to keep the Ice Dens – plural – thriving. “Coaches, managers, parents all working together for one common goal – one agenda,” he said. Success is certainly measured in different ways. 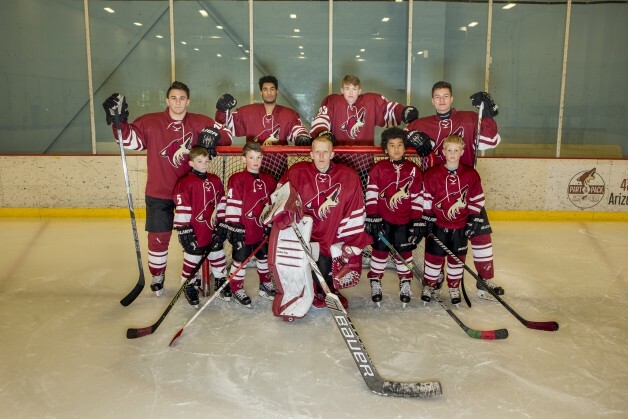 On one hand, just this month, the Jr. Coyotes Elite Tier I 18U squad reached the title round of the USA Hockey RMD (Rocky Mountain District) tournament, while the Jr. Coyotes 14U and 16U – all Arizona Tier I state champs – showed promise as well. “Each year, we’re getting closer to breaking through,” said DeAngelis, adding that a Tier I national tournament berth appears closer than ever – as would be a shot at the state’s first-ever USA Hockey Tier I national championship. But on the other hand, to DeAngelis, success is also evident when seeing what players accomplish once they move on to the “next level” – whatever that may be – in many cases after they hang up their Jr. Coyotes jersey. It’s that success that proves the CAHA/Jr. Coyotes system works. One example: Just last month, a trio of current and former CAHA players – Erik Middendorf, Ryan Savage and Adam Samuelsson – helped Team USA skate to gold at the World Junior Olympics in Lillehammer, Norway. In a twist of fate, it was 22 years ago that DeAngelis himself skated for Italy in that same city, on those same sheets of ice, in the 1994 Winter Olympic Games. Back on the home front, before players can dream of the NHL, Olympics or college hockey, it’s often AA calling first. This year, two AA Jr. Coyotes teams are representing Arizona as state champs at USA Hockey’s Tier II Youth Hockey Nationals. O’Hearn can’t help but be excited that while the 16U team from Scottsdale earned a berth, so did the 18U team from Chandler. “To me, that really speaks to the growth and the focus of what we want to put on our programs – great people, great coaching, great leadership and a synergy with what we’ve been doing in Scottsdale,” O’Hearn said. Corupe, naturally, is as happy as anyone about the success of the AA teams, including Chandler’s. But beyond the box scores, there’s a bigger picture here, he said. O’Hearn explained that coaches, parents and players are also taking ownership of their “new” Chandler rink – just like has been the case in Scottsdale for 18 years now.